Last April, following more than eight months of hearings, the county planning commission voted 3-2 to reject Phillips 66’s plan to build a rail spur so that crude oil currently delivered by pipeline can be transported to the Nipomo Mesa refinery by train. Phillips 66 responded by appealing the ruling to the board of supervisors, but also by filing a lawsuit. The oil company sought to obtain a court order sending the case back to the planning commission on the grounds that the commission misapplied land use rules in designating an area to be an environmentally sensitive habit area (ESHA), and thus rending the location undevelopable. 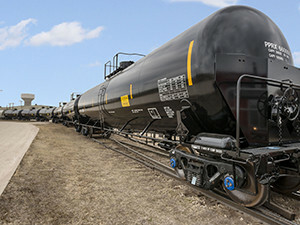 The planning commission made the designation after the rail spur project was already accepted, violating a land use ordinance deadline and wasting the company’s time and money, Phillips 66’s attorneys argued. SLO County, as well as six environmental organizations, intervened in the suit and asked LaBarbera to throw out the case and let the board of supervisors proceed with its appeals hearings. Last week, the judge asked for more information about whether the ordinance contains a mandatory time frame. But on Tuesday, LaBarbera issued a ruling siding with the county and the environmental groups. Labarbera stated in the ruling that the issue of whether or not the planning commission based its decision on a valid finding is a matter that should be addressed by the board of supervisors before the case comes to court. However, LaBarbera sided with Phillips 66 on one point. The oil company had also argued that the ordinance the planning commission used to reject the project was unconstitutional because it is vague. The California Constitution bars the county from ruling on that matter, LaBarbera said. According to LaBarbera’s ruling, Phillips 66 can file an amended complaint pertaining to the constitutionality issue alone. Special board of supervisors hearings on the Phillips 66 appeal are set to begin Monday and continue through the week. The funny part is oil already passes on the track going by the Phillips66 plant. People of San Luis Obispo County need to have a wake up call and realize that refinery is one of the safest in the whole country. I wish gas was ten dollars a gallon for all those protesters. By the way, if you reading this and your a protester please dont drive your gas powered cars to the rally it send the wrong message. Actually dont drive your gas powered car at all. Until there is a real viable affordable alternative to strictly gas powered vehicles I’ll drive the one I have. I’ll show my displeasure with big oil and its absolute assault on anything that will take from its profits in any form I want, including protesting when the opportunity avails itself. A safe oil refinery doesn’t mean a refinery not susceptible to a catastrophic accident and or long term effects that aren’t easily seen or detected (If you have any doubt about that just ask the residents of Avila Beach), combine that with “soft enforcement” and the dwindling power of the EPA folks like you morejobs123 should be paying twice the $10 a gallon you’d wish on folks like me. The question that everyone should be asking is what are the ages and types of tank cars that Phillips be using in that transport area. The newer ones (CPC-1232s?) from what I’ve read have been prone to failure while the older ones are just spills on wheels! I’d love to see tanker trucks off the roads of America but we need to make sure these tank cars are as safe as humanly possible, something that has never been done! LA Rams fan, you have no idea what you are talking about. Its obvious you have never herd of an electric vehicle (tesla, nissian leaf, chevy bolt etc), or public transportation for than matter. The reality is that oil companies make more than gas. Have you ever herd of a olefin, aromatics, plastics, medical grade oils or how about sulfur that is used in agriculture to change the ph of the soil. Oh wait, oil companies make all these products that we need? On the subject of rail cars, again you dont know what you are talking about. The life span of the rail car, its annual inspection date, manufacture date are written on the side in BOLD WHITE PAINT. I know this because i was on the inspection team for a large oil company. Secondly, the rail cars are double jacked with a steam jacket. I have never seen in ten years of working on a rail terminal a rail car just leak on its wheels. Do you even realize that the oil is trucked into the refinery right now? I hope these trucks drive down the street you live on every day or how about down the street of school your kids go to. Think about that when you protest. Yes, i agree no refinery is immune to a catastrophic accident. However this argument doesn’t really stand because you cannot build any petrochemical plant, refinery, power plant, wind turbine farm, solar farm, factory, etc without the potential for a catastrophic failure. and yes all these have had catastrophic failures. look them up if you dont believe me. you want to protest oil companies yet your carbon foot print is as big as every one else. If you think oil companies are bad you should look up biotech companies or tobacco companies. Their products kill more people than all oil companies combines. 1. Spill on Wheels doesn’t mean it leaks, it means it will rupture when in an accident. 2. Read my post again and consider what I said about loving to get tanker trucks off the road. 3. We are speaking of oil refineries and storage facilities and not the pit falls that are a part of renewable energy. When that subject comes up I’ll speak to that if I can. a. No new clothing (I shop exclusively at Goodwill and Salvation Army). b. I shower 4 times a week. c. I flush the toilet twice daily (unless there is feces present in my use). d. I use the heater in my home to warm it in the morning and that’s it (I bundle up). e. I drive when necessary and walk the rest of the time (I live 14 miles outside of town with no public transportation available. I just walked to the local store this morning, two miles round trip). f. I cook with wood when possible (I have a BBQ that I use, the abundance of wood around my area makes it pretty stupid not to). h. I buy most of my vegetables and meat at the local farmers market and grow some veges’ as well (it is very seasonal where I live so sometimes I do have to buy from a supermarket). h. All of my light bulbs are LED’s and I only burn one of those at a time. If you have some suggestions on things I can do better or differently please feel free. 6. Read any of my previous posts on how I feel about tobacco and I’m not that educated on the biotech industry to make any type of comparison. The hypenvirocrits would rather have more trucks on our public highways instead of utilizing the private rails. This activism has plagued the taxpayers long enough and this form anarchy (in my opinion) needs to end. No, The “hypenvirocrits” (that’s a great new word there George) don’t want more trucks of any kind on the road that burns oil based products!!! No doubt each BOS member has already decided how they will vote. The long meetings are just for show. Vote and get it over with.